After half a century as a pawnbroker, Josh Fish has heard it all: “One day a lady put her head around door and said, ‘I promised to take the kids to the cinema, please loan us the money’. I refused and she called me all the names under the sun,” he says. Josh is the fifth generation Fish to run the family business, which was founded in 1830. When he started work, back in the 1950s, the pawnbroking industry was quietly dying. Now he is seeing it grow at its fastest rate in more than a century. Fish Brothers has opened three new stores this year and is in the middle of refurbishing its five older shops. “Since the Second World War, if you wanted money, you had to go to the bank,” he says. “That’s not so easy to do anymore. The choices available to people have changed. Pawnbroking is the growth story of the credit crunch. There are no credit checks, little paperwork and the cash is available straight away. High street pawnbrokers typically charge between 5-7% interest a month. If the loan is not paid back on time, the pawned item will be sold or melted down to help cover the debt. The size of the industry has risen from £296m in 2007 to £851m today, according to the analysts Apex Insight. Four new stores have opened every week in 2012 on high streets up and down the country. Pawnbrokers have had strong economic winds blowing in their favour – falling incomes, vacant shop space and the decision by many banks to back away from the riskier end of the personal lending business. “Banks wouldn’t even look at me. They would definitely say no,” says Maria Jones. The young mother-of-three is waiting to redeem her necklace at Gemini Jewellers, a small family-owned pawnbrokers in Kent. The number of credit cards in circulation fell from 73 million in 2007 to 61 million at the end of 2011 as banks withdrew special 0% offers and tightened up lending criteria. Like many of the customers in the store, Maria says she pawns her jewellery to pay for everyday essentials – gas, electricity and food. You have to go back a long way to find the last time pawnbrokers played a major role in British life. At the end of the 19th Century there were more than 700 in London alone. The local pawnbroker’s shop, or “uncle” in Victorian slang, would lend against almost anything from gold rings to clothing, blankets and boots. But the industry almost died out after World War I as incomes increased, banks offered new forms of credit and the welfare state was created. 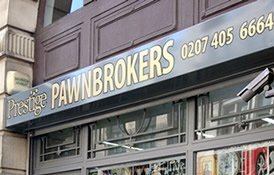 By the 1980s there were fewer than 50 pawnbrokers left in the UK. The industry’s resurgence started in the late 1980s as regulations were relaxed and larger pawnbroking chains started to emerge. Many now offer other forms of financial services from payday loans to gold buying and money exchange. Modern stores with their well-lit counters and private valuation rooms are designed to look less like a Victorian money lender and more like a high street bank. Pawnbrokers say the new look is started to attract a new type of customer. Twenty per cent of Fish Brother’s business now comes from the Asian and East African communities that have settled around the East End of London. The size of the average loan has risen six times over since the start of the financial crisis, partly because the company has started to target a more affluent customer. At the very top end of the market is a new type of pawnbroker. The “asset finance” company takes the same business model and applies it to rare, high value items. “We’ve loaned against everything from boats, planes and helicopters to a Picasso and a Lowry,” says James Constantinou, the founder of Prestige Pawnbroking based in the affluent market town of Weybridge in Surrey. He set up the business three years ago in the middle of the financial crisis, lending not just to individuals but to companies struggling in the downturn. Clients must pay between 2-7% interest a month, depending on the nature of the loan. Businessman Mark Landsberg, handed over the keys to his Porsche 911 to pay a looming tax bill due in the New Year. Watch Jim Reed’s full film on the changing face of pawnbroking on Newsnight on 20th December 2012 at 10.30pm on BBC Two, then afterwards on the BBC iPlayer and Newsnight website.